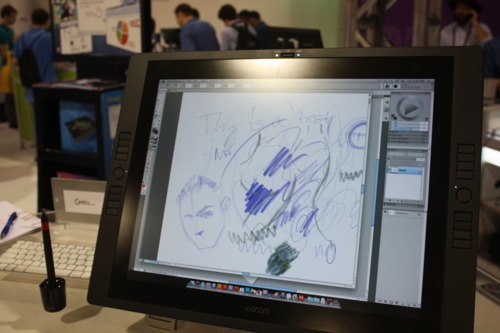 Something pretty for all you Wacom nerds: The Wacom Cintiq 21UX. It’s a 21-inch touchscreen offering all kinds of functionality for Creative Suite pros. It detects 2040 levels of pressure from the pen, has 16 express keys, and uses 2 sliders with 4 settings each. It’s $2,000, and the 12-inch version is $1,000. The guy I talked to said these have been out “for a while”…but in the tech world, that could mean they launched last year or last week. ← Two Terabytes of Storage on an SD Card?